The former Bolton striker was found guilty of attempting to manipulate matches. 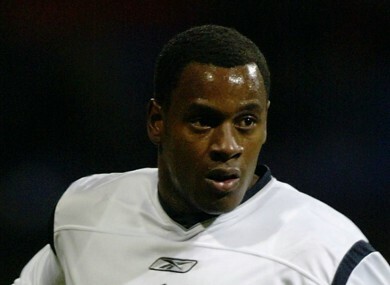 Former Bolton Wanderers player Delroy Facey. FORMER PREMIER LEAGUE player Delroy Facey has been jailed for two-and-a-half years after being found guilty of conspiracy to commit bribery. Facey, 35, was sentenced at Birmingham Crown Court today alongside semi-professional player Moses Swaibu, 25, who was sent down for 16 months. A Daily Telegraph investigation revealed in November 2013 that a ring of individuals, including Facey, were responsible for attempting to fix games in the lower leagues of English football. It follows the conviction of three men in June 2014 in connection with the same matter. Facey played 10 games in the Premier League for Bolton Wanderers between 2002 and 2004, and has also played for the likes of Hull City and West Bromwich Albion. He represented Grenada at senior international level. NCA lead officer Adrian Hansford added: “The NCA is in no doubt that this was the beginning of a concerted attempt to build a network of corrupt players in the UK. That network included Facey, who acted as a conduit for potential targets, and Swaibu, who was recruited to expand the network further. “They deliberately targeted lower leagues believing that because players earn less they could be more susceptible to taking a bribe. The NCA had a vital opportunity here to intervene early and secure the evidence to get convictions before any of their plans could succeed. Email “Ex-Premier League footballer jailed for two-and-a-half years for match-fixing”. Feedback on “Ex-Premier League footballer jailed for two-and-a-half years for match-fixing”.